With Portland’s typical giddy fanfare for anything bicycle related, the city’s bike share program went live today. 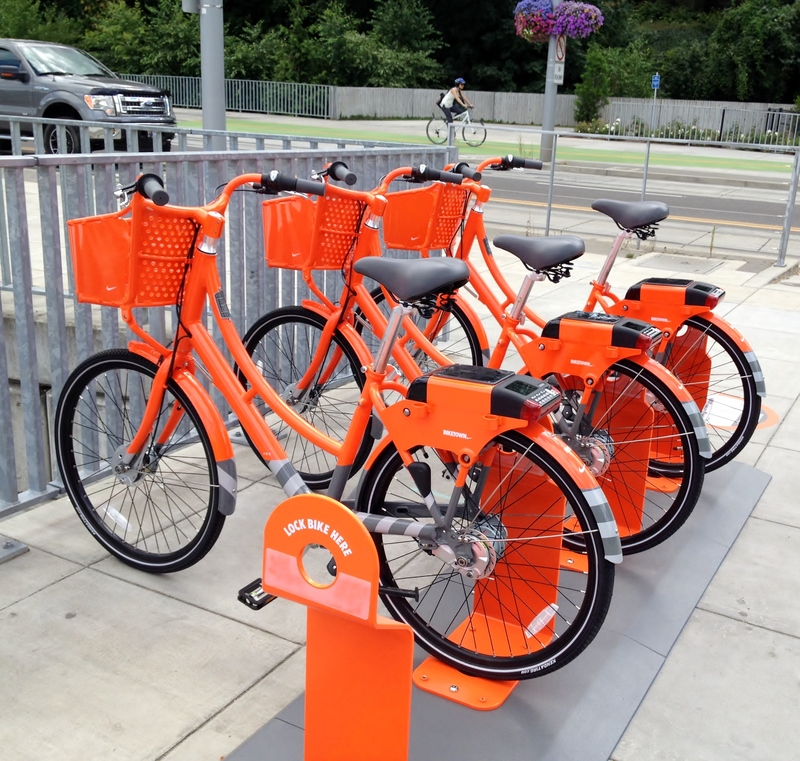 I had tentatively planned on attempting to test ride one of these bikes today, and as it turned out, all of the day’s mishaps led to my first ride on one of these orange monsters. I was down at South Waterfront awaiting an annual doctor appointment which went awry. My physician’s schedule got seriously backed up so after waiting for too long, I had to reschedule and move on to my next appointment. 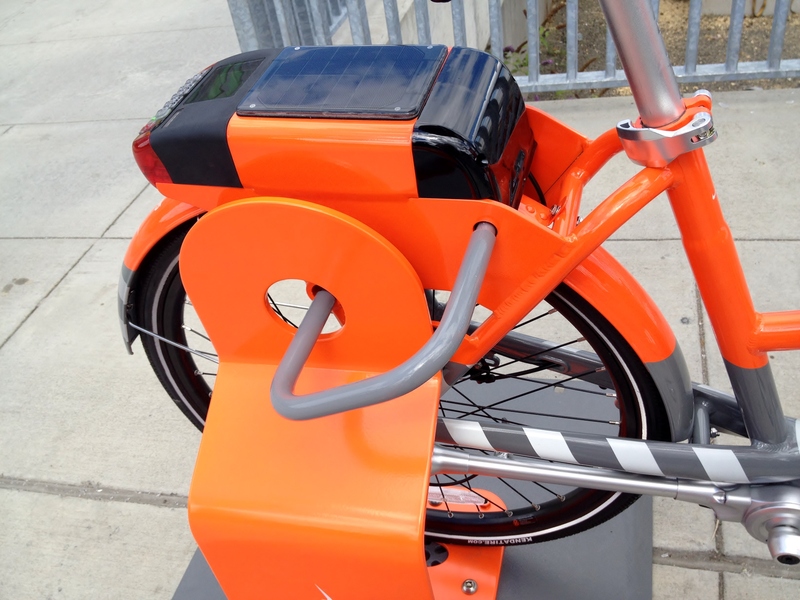 But, while I was cooling my heels in the waiting room I had time to download the Biketown app on my iPhone and go through the steps to set up an account and review the process of renting the bike, which at first seemed kind of daunting. 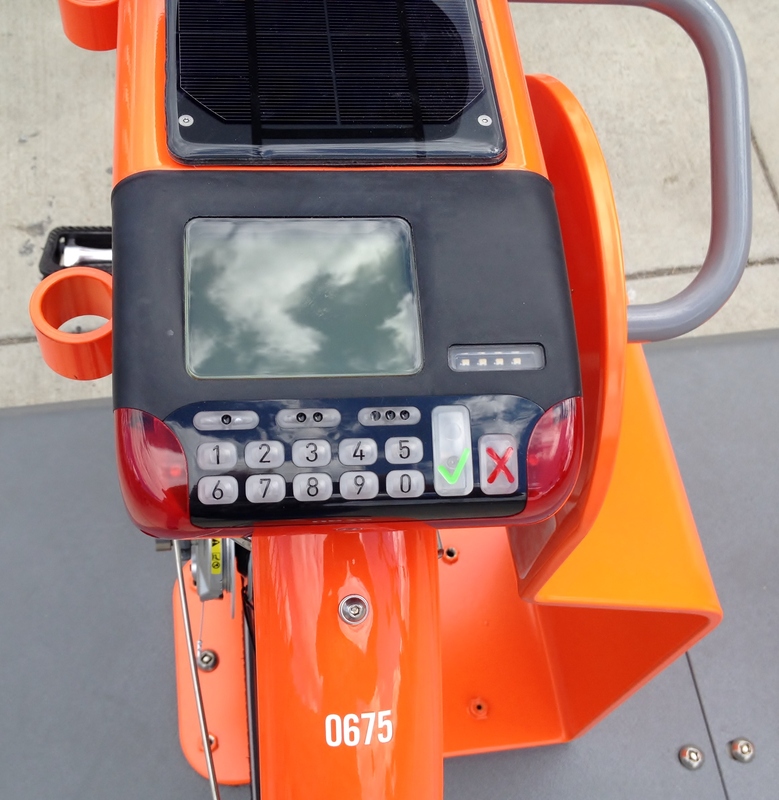 Thankfully, the app worked perfectly so that when I exited OHSU to the street level to feast upon the orangeness surrounding me, it was very easy to enter my codes into this solar powered key pad and unlock the bike from the rack. Unfortunately, the bike I unlocked turned out to be unrideable. 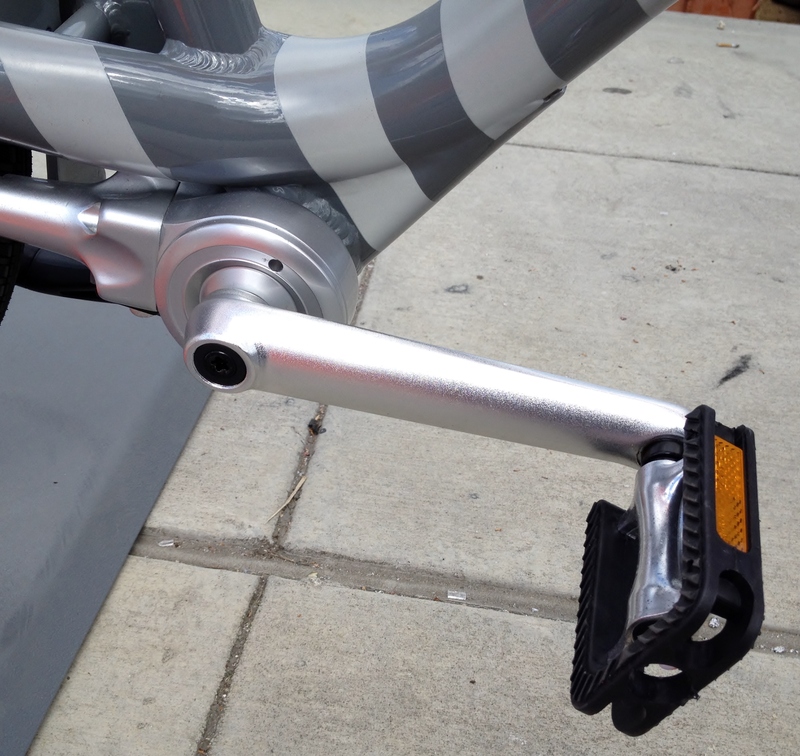 The bike’s quick release for the seat post binder bolt would not hold position because the nut on the bolt could not be turned to tighten it. Lacking any tools, and knowing that I was not willing to damage (further) my knees with a too low seat height, I put the bike back into its rack and forfeited my $2.50 rental fee. 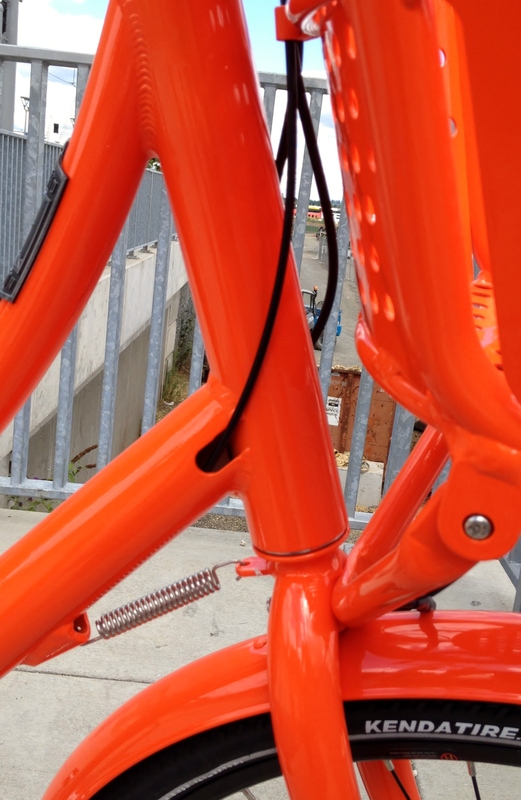 Then, I checked the seatpost QR’s on all the other bikes in the rack and found that they similarly could not be tightened adequately to hold the seatpost, until I finally spotted my ride – an orange monster parked askew with the seat post jacked way up. So, I entered my codes again – a very easy process that involves an account number plus a PIN, unlocked the bike, slung the lock into its holder on the left side, tossed my brief case into the front basket (which is very narrow), and started to get underway. During this process, several cyclists approached me and asked about the steps involved in renting these bikes and how the system works. I did my best to educate them with the tiny bit of knowledge in my head at the time. Then I mounted the 45 lb. machine, which involves pushing your leg above the lowered top tube rather than throwing a leg over and which actually seems harder to do. Immediately I noticed the terrible handling – a result of ill conceived frame geometry for a bike which is designed to carry its weight on the front. The bike wobbled around as I got underway, and I felt like a novice cyclist rather than the experienced rider that I am. Once moving, I was okay, but anytime I put my foot down the bad geometry kicked in and the bike weaved from side to side. But, as with any bike, you can adapt to strange handling characteristics with enough saddle time. I’m not sure I really want any more saddle time on these bikes, though. My 1950 Raleigh Sports Tourist, which also weighs 45 lbs is an absolute gem in comparison, being well balanced, easy to handle, and with an amazingly comfortable, if upright, riding position. 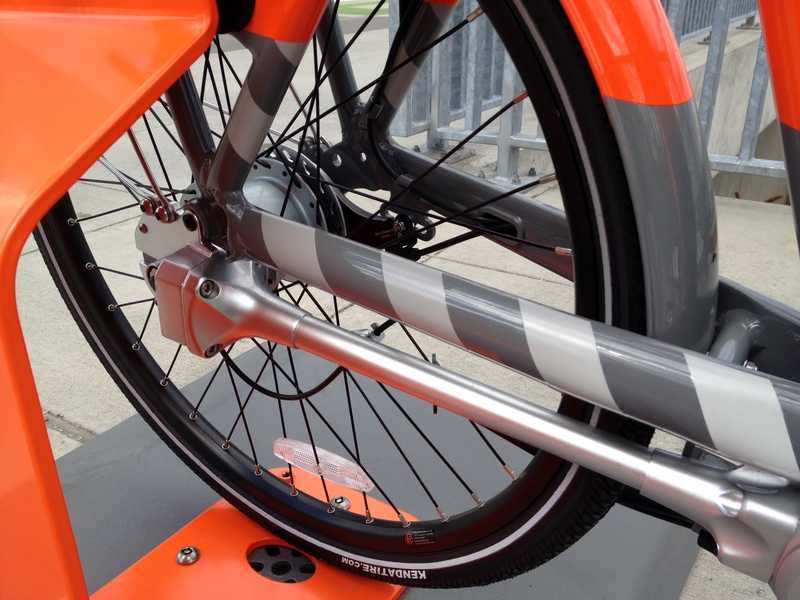 These bikes, provided by Social Bicycles, aka SoBi, are equipped with a shaft drive and an internal Nexus 8 speed hub. Having not ridden a shaft drive before, I was curious if I would notice any particular differences as compared to a chain drive. And, I hadn’t tested the Shimano 8 speed internal hub, so I was also curious how this component would perform. Since I needed to head over the to east side of Portland, that meant taking the Tilikum Crossing‘s mild but long hill in my work clothes. These bikes have no bottle cage, so even if I had a water bottle, it would not be readily accessible. Riding east over the bridge, I was passed by ALL cyclists, and a few called out to ask me how I liked the ride. I found the shaft drive to feel fairly normal, but the Nexus hub seemed to have a lot of inefficiency in the lower gears. I only engaged the 4th and 3rd gears of the hub, but those gears felt so compromised that I ended up stomping up the hill in a higher gear so I could avoid the sluggish feeling that the hub offered in the lower gears. 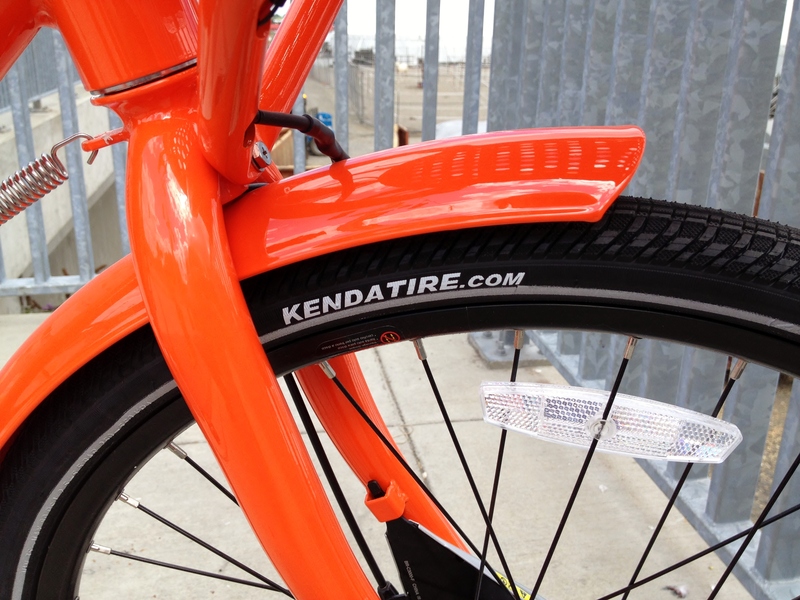 The Kenda tires were fine and seemed to absorb some road shock, but the High Nelly upright position made my back hurt right away. 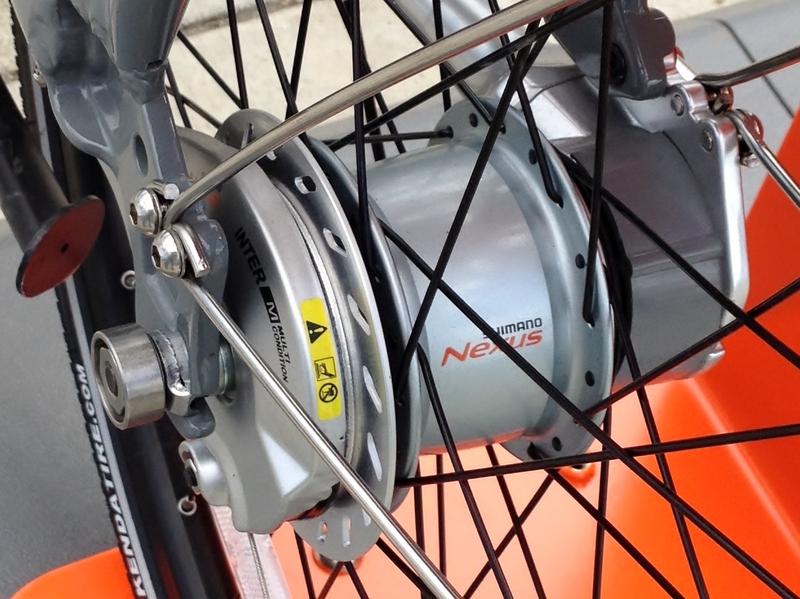 The drum brakes required a lot of force to stop the bike quickly, making me think “whoa, Nelly!”. At least there would be no danger of doing an endo on one of these machines. By the time I got to the east side of Portland, I couldn’t wait to scan the horizon for the first orangeness I could spot. I ditched this bike at a Bikeshare rack along the Max line, and continued the rest of my journey via public transportation, having spent a total of $3.60 to rent the bike, and now spending another $2.50 to continue on my journey. While on the bus, I sent an email to customer support to alert them to the seatpost QR issue. A few hours later I received a response letting me know that if you encounter any mechanical issue with a bike, put it back in the rack and hit the “repair” button on the keypad and the bike will be taken out of service until the issue is resolved. Who are these bikes for? Well, maybe Nike can answer that question. Portland is unique in that its Bike Share program is not funded with taxpayer dollars, but rather relies on the millions received from corporate sponsors. Possibly, these bikes could be useful for inner city users who need a quick jaunt to areas not covered by public transportation. The apps provided by SoBi worked extremely well for me, so the barriers to use involve not technology, but lack of access to technology. And that will be my final criticism for this program. Who is it helping? Those who don’t really need help at all. 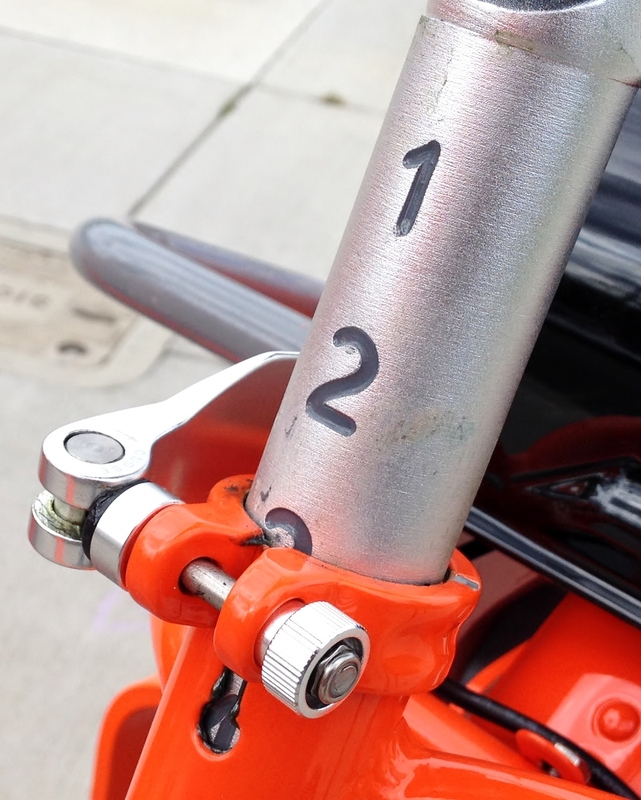 This entry was posted in Bicycle commuting, bike share, city cycling, Commuter bicycle and tagged Bikeshare, Nexus 8 speed hub, Portland bike share, shaft drive, SoBi by Nola Wilken. Bookmark the permalink. Looks like it could be applied if you miss the last bus to wherever you’re going. To me, the question begs: Why didn’t they just find old, respectable 10-speeds from the 1970’s and refurbish them? (Maybe they figure no one in their right mind would ever steal a 45-lb bike). Boston has a similar system of bikes-for-rent, and apparently, the program is successful. Hi Paul, Interesting comment about good old reliable 10 speeds. There are other bike rental services in Portland who offer chain driven bikes with derailleurs, chainguards, and lighter weight frames, although most appear to be aluminum. I wonder how those businesses feel about Portland Bike Share, and whether the $10 million from Nike will essentially wipe them out. Those look hideous. 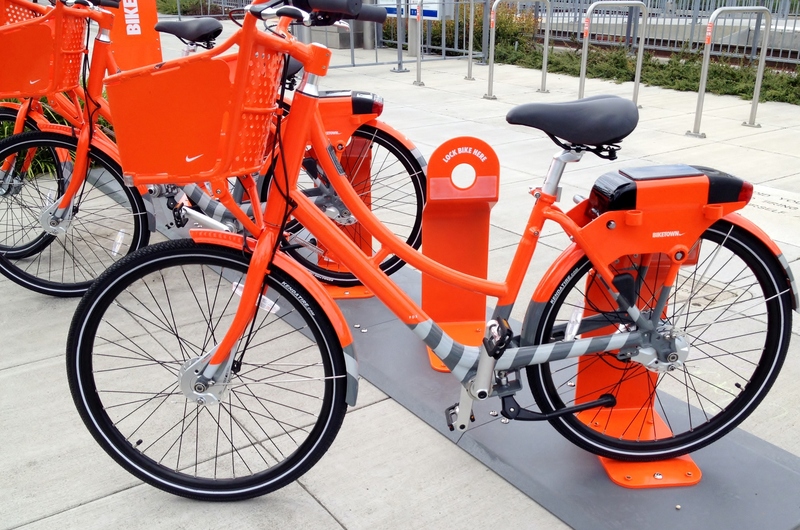 Vancouver canada is getting it’s bike share program and the bikes look similarly unridable. There is concern that the program will put all the bike rental places out of business, also those who already ride have bicycles. Novices trying to ride bicycles such as this may just end up being frustrated. It would be cool and super sustainable to gather up piles of forgotten well made vintage bikes, clean them up, simplify them and make them available to rent. I remember Winnipeg Manitoba had such a program years ago simply out of necessity and lack of finances. But you know people want new,people have an idea in their head of what bike share bicycles look like, and less money is involved if you refurbish existing bicycles. At one time, Portland had a “create a commuter” program that was run by the Community Cycling Center. It was meant to target economic justice issues as they relate to commuting and access to transportation options. Participants received their own refurbished bike and related equipment after learning basic maintenance and bike commuting lore. Unfortunately, that program no longer exists, although there is a similar program here operated by a few nonprofits. For bikeshare programs to actually be about “sharing”, that would mean a lot more thought going into them by people other than corporate branding experts. At one time, bicycles were the transportation mode of the masses, instead of the toys of the well-off. One reason Pdx’s bikeshare bikes are so heavy is that the technology for them is built into the bike rather than into the kiosks. However, a heavy bike does not have to be an unridable mess. True on your last point, Nola: One fine example is your 50’s Sports. The Schwinn Superior also comes-to-mind. Personally, I hope people will not be lead into which bicycle they decide to ride, but instead, increasingly ignore these awful bicycles. If money is an issue to a prospective rider, I think the best place to go is the annual, spring police auction that most towns have. (I got a 1960 Raleigh “3-speed” for $5.00). At first glance at this bicycle share program, it appears that it is a step in the right direction, to bring people closer to a “green” lifestyle. I would hate to see everyone forsaking all the wonderful machines that are available, and, with a little focus and effort, eminently rideable, in favor of these nasty bikes. That will never happen, though: People know what looks and feels good.., and people want water bottle cages and sachels attached to their bikes. These bike share programs are not well-thought out, and, maybe unfortunately, I hope they just go away.